Yesterday I just had to pop into my local Lush store to have a browse at their new Valentines Day collection 2014. 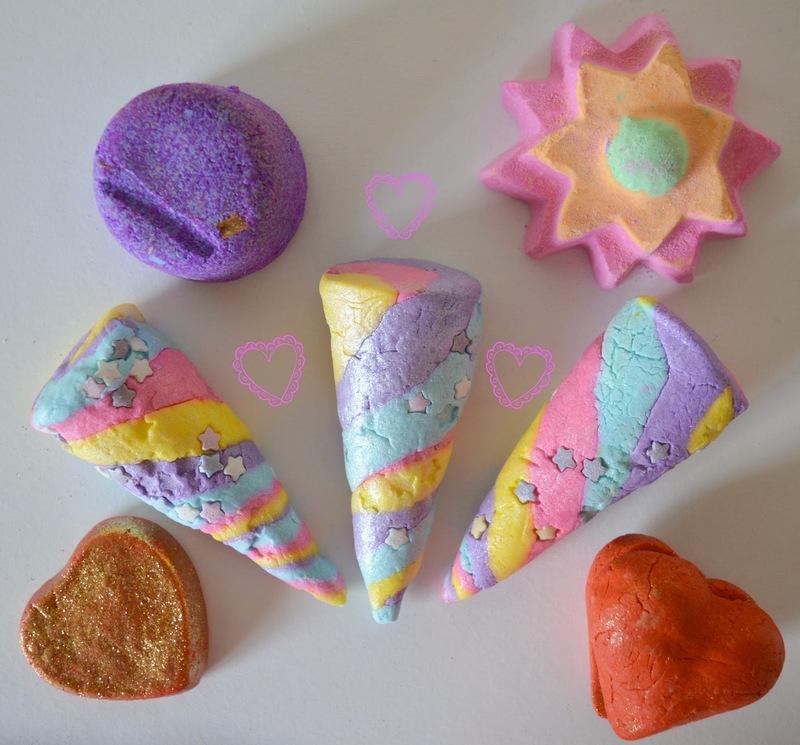 I had seen some pictures of the collection on some other blogs and was dying to get my hands on a few of the products, especially the Unicorn Horn - who can resist anything to do with unicorns and rainbows? Not me! I have to admit thought that I was quite taken aback on just how expensive the collection was, everything was €4.25 and up which I do think is quite expensive for a bath product, one bath bomb which I had to leave behind as I just couldn't justify the price was €8.75, I just couldn't pay that for something which didn't even have bubbles. When I first saw this online I thought it looked amazing and when I finally saw it in person I thought it was the prettiest bubble bar I had ever seen! I would absolutely love if Lush would make this part of their permanent range because I'd be buying it every week! Please Lush Gods add this to the permanent range! Unicorn Horn features pastel rainbow swirls, stars and lots silver glitter - what more could you want in a bubble bar? This is one of those products Lush comes up with once and awhile that really is too pretty to use, but I can never resist anyway... It really does smell amazing and contains lavender, ylang ylang and neroli oil for a calming and dreamy bath time. I've already used one and the bubbles are amazing - review to come soon. This is a sweet and slightly small bubble bar which is described as red but I think it's more of an orange colour, encased in golden glitter it's the perfect little luxury for a Valentines inspired bath. Lonely Heart contains ylang ylang, bergamot, jasmine and lemongrass for a soothing and zesty bath. I love the golden lustre on this, a feature of other Lush products I've used in the past and it always makes the water look magical. It has to be said that I'm much more of a fan of Lush's bubble bars rather than their bath bombs, purely because I like a nice bubbly bath, however, I do love flowers so I couldn't help but pick up this pretty Floating Flower bath bomb. I have high hopes for this bath bomb as the lady in the shop said it was responsible for her having the loveliest dreams after using it just before bed - I hope I have the same experience! It contains ylang ylang, jasmine and cyrus oils which give a gorgeous, strong scent to this bath bomb. Heart Throb reminds me of a little macaroon, only heart shaped of course. It has two separate red parts with a layer of golden glitter in the middle and it really does look like the perfect bath product for Valentines Day. This bubble bar should turn the water bright red so I'm looking forward to that. It also contains shea butter which will be perfect for leaving my skin super soft. Finally I picked up Phoenix Rising which isn't part of the Valentines Day collection but I couldn't help but pick it up anyway, the purple colour is so pretty! There's a slight hint of gold in this too and I think it'll make for quite a luxurious, purple bath. Will you be picking up any of the Valentines Day collection to give yourself a pamper in the lead up to the day of all things love or even on Valentines Day yourself? I do not own a bath, so I have been really bummed that I can't try any bath bombs or bubble bars. I see some people use it in the shower too, but that doesn't sound so nice haha. Awh what a shame Inge, Lush do have lots of great shower products though, I love Rub Rub Rub. Aren't they?! I love them but yes the price of some was just too much for me. I thought it was an expensive collection too. I guess it was the Locket bath bomb that you left behind? I wanted this one too but like you, I couldn't spend £6+ on it. I have read it makes at least two baths (if you split it) but I still left it behind.. This looks amazing, lush can always be trusted! I have a friend who raves about Lush! I am going to have to look into these bubble bars they sound amazing! !